South Burnett Deputy Mayor Keith Campbell was elected chairman of the Burnett Inland Economic Development Organisation (BIEDO) at the organisation’s AGM held in Gayndah on Friday. 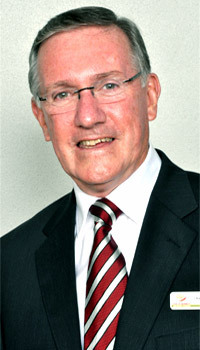 Cr Campbell replaces Cr Paul Francis, from the North Burnett Regional Council, who has been chairman for the past four years. “He has done an admirable job and has served BIEDO well over his 15-year involvement,” Cr Campbell said. “I’m personally very supportive of the efforts of BIEDO. “We have an excellent CEO, Carmel Somers, and loyal and supportive staff. “The reputation of BIEDO, its past achievements, networks with government and funding bodies together with a strategy of where the organisation is headed into the future augers well to deliver services directly to clients. “BIEDO is not just another ‘all talk and no do’ economic development organisation. BIEDO gets in there and does the job. “The concentration is on the small business sector.